Sigur Ros is a name I’ve borrowed from the ethereal-sounding post-rock Icelandic band. Literally, Sigur Ros translates to “Victory Rose”, and I count that name a good omen for this beautiful filly. 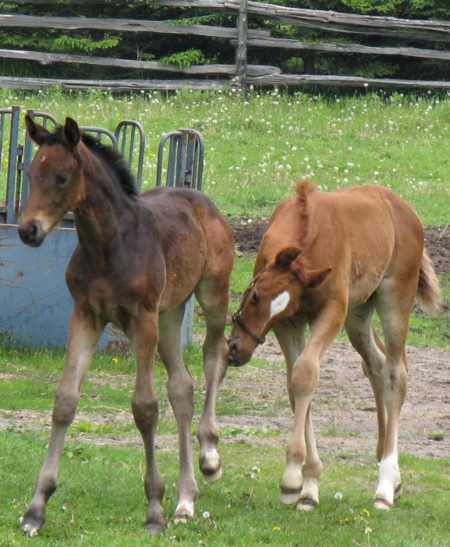 This “repeat-breeding” filly is all legs, with a long sloping shoulder, well-set neck, and big liquid eyes. The Sandro Hit / Brentano II cross is a proven one for dressage excellence. Witness the success of Poetin, Samba Hits I through IV, Samarant and other performance and breeding stars. Last year’s full sibling from Bretania was selected Reserve Best Filly at her large VhW inspection, roundly praised by Dr Christmann for her powerful movement, freedom through the shoulder, and good type. What he couldn’t see was the gentle, willing disposition that made Sobella a joy to work with and observe. I expect this sister will show us more of the same! SOLD, at 1-day old, to Kim and Jason in New Jersey. Sigi is shown here with her buddy “Word of Honour” and with her 1st foal, a colt by Johnson. Sigi is now schooling 3rd level, at 6 years of age. Very talented!